Alyria is a leading skincare product line made by the Canadian skincare manufacturer Canderm Pharma Inc. Alyria is clinically proven and is recommended by dermatologists and skincare specialists worldwide for its revolutionary anti-aging skincare products. Alyria are effective skin care products that reduce the appearance of wrinkles and fine lines using a combination of Vitamin A, peptides and polymers. Vitamin A, commonly referred to as retinol, is the leading ingredient in anti-aging skincare, Alyria skincare products combines retinol with other leading ingredients to create unique concentrated formulas that rejuvenate skin cell turnover repairing unsightly wrinkles and lines which results in making the skin appear younger and healthy looking. Alyria uses a patented delivery system called Amphoteric System, which releases key anti-aging skincare ingredients slowly allowing the vitamins and minerals to penetrate deep below the skins surface, dramatically improving the skins overall health and appearance. 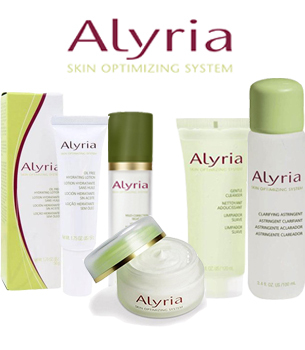 Alyria skincare has a full line of products to help correct and prevent the signs of aging. Alyria Intensive Wrinkle Correction is a popular product for targeting wrinkles that reduces the appearance of even deeply formed wrinkles. The majority of Alyria skincare products contain sun protection to prevent photo-aging and skin damage from the sun which is one of the main factors that cause the development of wrinkles and fine lines. Alyria skincare products work to repair skin cells and protect the skin from environmental conditions. Alyria actively promotes using a night cream after thoroughly cleansing the skin to aid in the absorption of the products because skin is clean and fully relaxed during the night hours allowing the special formulations to work to their fullest while you sleep. Alyria produces skin care products for all types of skin and conditions and has been featured in many magazines worldwide, making this a popular choice for many women and men.